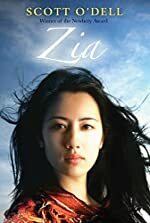 Review: Zia, is the heartwarming and heartbreaking sequel to the Island of the Blue Dolphins. Written by Scott O' Dell, it answers the biggest question from the first book, "What happens to Karana?" The main character, Zia, wants to find her long lost Aunt Karana. Zia's tribe consults with her about leaving Karana behind at the Island of the Blue Dolphins, but she wants to find her and bring Karana home to the Mission Santa Barbara. The Mission is Zia's new home. This is a spectacular story about making dreams come true. People don't need words to communicate, just ask Zia and Karana. They communicate through hands and motions after Karana is brought to the mission. Before Zia lived at the mission, she lived in peace with her tribe. Then Zia's tribe was asked by two padres, to go to the mission to work and live there. Zia, likes the mission because the people there feed and clothe her. One of the fathers at the mission, Father Vincente goes to find Karana, and brings her home to the mission. This part of the book kept me on my toes the whole time wondering whether he would be able to find her and bring her home. Zia is a fantastic book. The author Scott O'Dell really sets the scene with the people's feelings. For instance, he makes the reader feel the misery or the joy people are feeling. The misery is mostly at the mission. For instance, it is miserable to have to work with no pay. This book is not only heartwarming but also heartbreaking at times. I rate Zia five stars. I hope this book will be part of a long series of books. Zia taught me a huge lesson, to never stop trying until you have succeeded at your goal. That can be applied to my life because I always feel like I want to give up but Zia taught me not to. Zia is the best in the series so far! We would like to thank Houghton Mifflin Harcourt for providing a copy of Zia for this review. Have you read Zia? How would you rate it? nice essay...i like how you included all the details from the book..